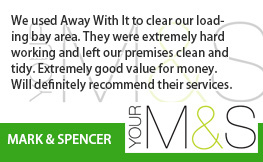 House clearance with from Away With It is quick and budget-friendly, regardless of your specific requirements. We know that house clearance can be stressful so we ensure that our service is prompt and no-nonsense, meaning you are rid of your unwanted household items in a flash. All you need to do is sit back and relax as our friendly team members handle the heavy lifting and load your unwanted furniture and belongings onto our safe disposal vehicles. From the largest to smallest items, we have seen it all. So, if you want speedy and affordable house clearance in Redbridge, get in touch today! Why Choose Us for Redbridge House Clearance? Is your broken fridge-freezer causing chaos? Are you dreading dragging your unwanted sofa into the back of a van? Whether one item is giving you grief, or if you need an entire property emptying, give us a call. We are championed for our flexibility and timelessness. We know it is important to fit around our customer’s lives, so we are open from 7am to 11.30pm, 7 days a week. No longer will you have to sacrifice your weekends or take a day off of work to get a job done. We will schedule a perfect time to suit you, and your team will always give you a call when they are on their way to your property. 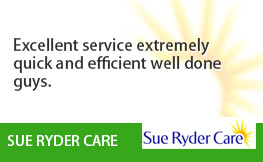 As a result, no matter what your plans, we tailor our service to your specific requirements. Furthermore, unlike other services that have you sitting at home all day, Away With It will provide you with a dedicated two hour time slot. So if you’re in the midst of transferring to another property, or have a lot on your plate, we can clear your house whenever is best for you. 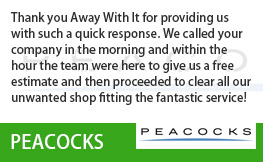 We have been providing house clearance in Redbridge for over 15 years and we love seeing old and new faces using our services. 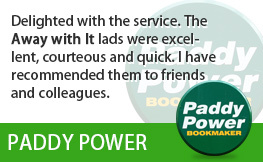 We often find that customers recommend us to their friends, impressed by our seamless and friendly service. 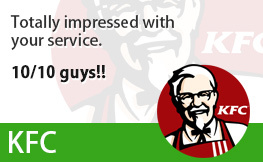 We go out of our way to make sure you get the best service possible. 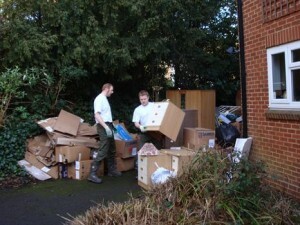 If you are worried about the debris and mess that may be left during your house clearance, there is no need. 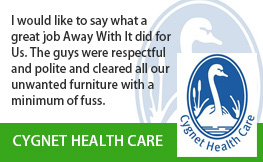 Our teams will clear the items you wish, and then clean up after themselves. Your property will be immaculate, as if we were never there! You will be hard pushed to find a higher level of service. Did you know that we can remove almost all non-hazardous waste? If you are concerned about an item you want disposing of, you can always give us a call to check. Once we have removed your waste, you do not need to feel anxious about where it will be disposed. 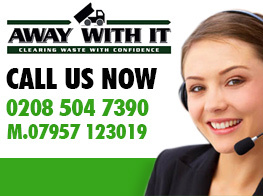 Away With It are full licensed and insured waste removal experts. Furthermore, we have a green approach to what we do, recycling 80% of what we remove. You do not need to fear a huge invoice from Away With It. We will give you a no-obligation free quote at the beginning of the process and this is exactly what you will pay for your house clearance service. Furthermore, because we charge by volume of waste and not by load, our clearance services are often far more cost effective than competition providers.